Historian Ramachandra Guha believes if Sardar Patel was alive, he would never approve of making the 182-metre statue, says Patel had no PM ambition. New Delhi: As national parties in India compete with each other about who is more ‘Hindu’, noted historian Ramachandra Guha believes the idea of a ‘Hindu rashtra’ is further along than it has been before. 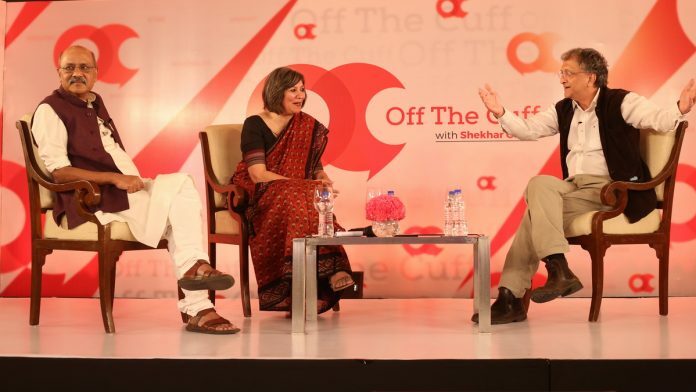 “In terms of insecurity (among the minorities) and shifting the new normal to making India a Hindu country, we are further along the road than we have been before,” Guha said, speaking at Off The Cuff in Hyderabad Thursday. He was in conversation with ThePrint Editor-in-Chief Shekhar Gupta and Editor, National and Strategic Affairs, Jyoti Malhotra. Speaking about the rise of Narendra Modi, Guha stressed that 2014 Lok Sabha elections were full of idealism with people willing to give Modi a chance. “He had charisma and appeal. He even reinvented himself as a non-communal inclusive leader who represented everyone. Somehow there was a personality flaw that he did not have a feedback loop,” Guha said. At the same time, he believes Modi came to power with a lot of goodwill. Speaking on the achievements of first Prime Minister Jawaharlal Nehru, Guha said, “Nehru’s greatness and contributions are vitiated by the fact that a wholly illegitimate family has taken his place. “If Nehru was alive today, he would have disowned the entire Nehru family,” he added. Guha also believes that till the time another Nehru-Gandhi is at the helm of the Congress party, the former PM will not get his due. “If Kiran Reddy is made president of the Congress party and stays on for 10 years, there would be 10 books praising Nehru, and we would all read them and like them,” said Guha. Mahatma Gandhi, according to Guha, transcends caste, religion and possibly even gender. “One of Gandhi’s greatest achievements was that he could make leaders out of followers,” said Guha. “That is something Modi can’t do. Indira Gandhi couldn’t do, and our cricket captains could never do,” he added. Speaking about the recent protests against women’s entry to Sabarimala temple in Kerala, Guha said that Gandhi would be severely disappointed. “Sabarimala is where Gandhi went in the 1920s and campaigned for the entry of Dalits,” said Guha. According to Guha, Gandhi would be appalled by the RSS’ ideas that “Hindu’s are vishwa-gurus”. Gandhi was able to recognise two shortcomings in Hinduism — treatment of Dalits and treatment of women. “He tried, with a limited amount of success, to address the two,” said Guha. In the wake of PM Modi’s unveiling of the 182-metre Statue of Unity, dubbed the tallest statue in the world, Guha said that Patel would have been most disappointed with such a statue. “One has to ask, would Patel want to celebrate national greatness by the height of a statue, that too of himself,” asked Guha. Guha also believes Nehru stayed on in power too long. “The interesting question is not what if Patel lived on for longer; it is what if (Lal Bahadur) Shastri hadn’t died,” quipped Guha. “Patel did not want to be PM. He was dying. The real tragedy is that Nehru stayed on too long and Shastri died too young,” he said.